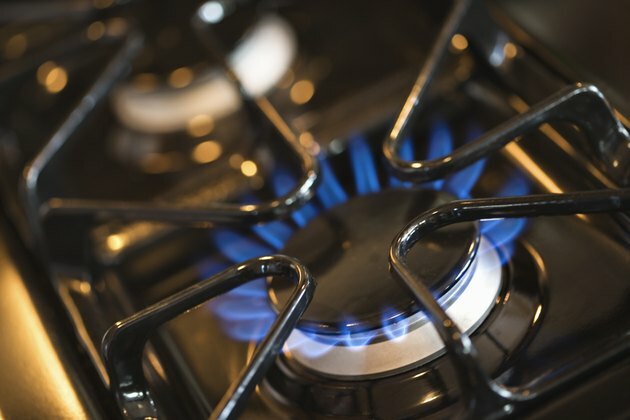 Some gas stove tops use gas to fuel the flame and an electrical spark to ignite it. Unlike electric stove tops, gas stove tops with electric igniters require electricity only to start the fire burning, and not to generate heat. Stove top igniters can become dirty over time, with normal cooking and cleaning. It is important to keep your stove top igniters clean, and clear of obstruction, to ensure properly functioning burners. The process of cleaning your gas stove igniters requires only some basic household items, and a few moments of your time. Gas stoves typically have one igniter for every two burners. Disconnect your oven from the electrical outlet to stop all current from flowing. Remove all the burner grills from your stove top. Raise the stove top by tilting it upward from the front. Follow the manufacturer instructions for this process as all stove tops have their own methods of providing access to the hardware beneath the surface. Locate your stove top igniters. The typical kitchen stove top will have one igniter for every two burners. These igniters are mounted at the midway point between each set of burners. An electric starter will have two tubes running away from it, and will resemble a spark plug with a metal hood above, and a metal diode reaching upward from a ceramic base. Use your clean toothbrush to loosen and remove any debris, food items or dust from the diode, the grounding hood, and the immediate surrounding areas. Only when completely free of foreign substances will your electric igniter function properly.